The imagery in this shirt was thoughtfully designed to convey a strong message about the struggles to recuperate after Typhoon Haiyan. The elements of wind and water on the Philippines flag are the environmental elements that make up a typhoon, the sun represents the Philippines, and the hands reaching out under the sun symbolize charity and to inspire people to give back to the country. 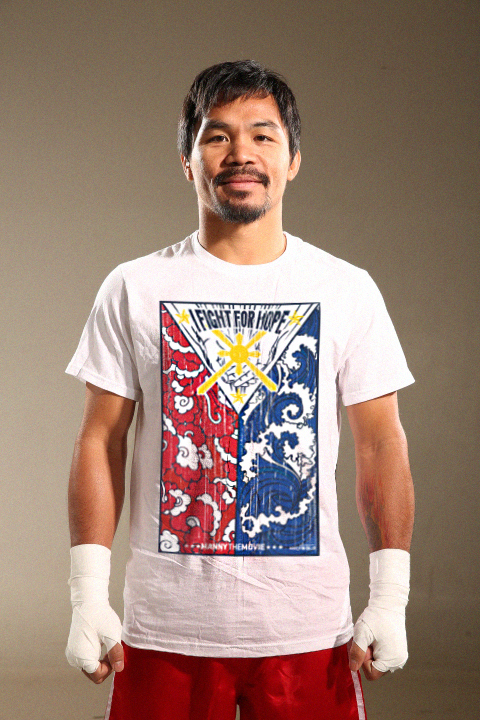 The "I Fight For Hope" slogan is about Manny's life. He fought for his family to feed them, fought for his people and country, and now he fights for hope. Join Manny, Linkin Park and our film team by purchasing a shirt and show your support. 100% of proceeds go to Music for Relief to provide help with medical care, food and water. Post photos wearing the t-shirt on twitter, instagram, and Facebook to show your support. #mannythemovie #ifightforhope #musicforrelief #linkinpark.